One of the most notable putters to ever play professional golf will be coming to Ottawa. Brad Faxon, an 8-time winner on the PGA TOUR, and winner of 21 professional titles, will be at the Greyhawk Golf Club in Cumberland, ON on April 2 to address members of the PGA of Canada as part of the PGA Training Academy by Titleist/FootJoy education program. 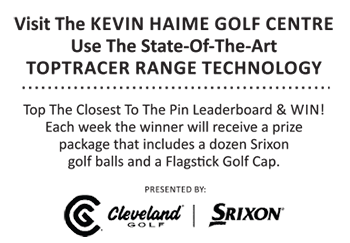 “Inside the Lodge with Brad Faxon,” will have the the two-time Ryder Cup player and winner on the PGA TOUR Champions speaking with the golf professionals about putting, playing the tour, and more. Faxon has recently be assisting 4-time major champion Rory McIlroy with his putting. It paid off with a win at The Players Championship. Accompanying Faxon and also contributing on the day will be Mike Rowan, Director of Sales at Acushnet Canada, and Peter Broome. Broome is the Vice President of the Acushnet Company and based at the company’s Headquarters in Massachusetts but is originally from Brockville, Ontario. The event is exclusively for members of the PGA of Canada and other industry professionals (at a slightly higher rate) . Registration for PGA of Canada members will open in a few days.